What Was Sailor Moon’s Original Title? One of the details that’s rarely discussed (which isn’t too surprisingly, since it’s not terribly well known) is that the official title of the series that we all know and love – Pretty Soldier Sailor Moon – wasn’t actually decided until the last minute. 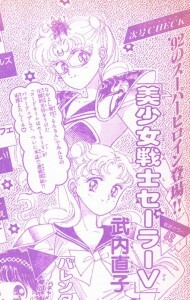 In fact, as of November 1991 (the material printed in the January 1992 issue seems to have been compiled at this time, as noted by the date written in the lower right of her sketch – November 5, 1991), Ms. Takeuchi and the editors at Nakayoshi magazine were still referring to the series as Pretty Soldier Sailor V.1 Fortunately, that’s not all there is to the secrets that can be found in this old back issue. In fact, there’s even an interview with Ms. Takeuchi in which she discusses some details about the series, some of which weren’t even actually used! 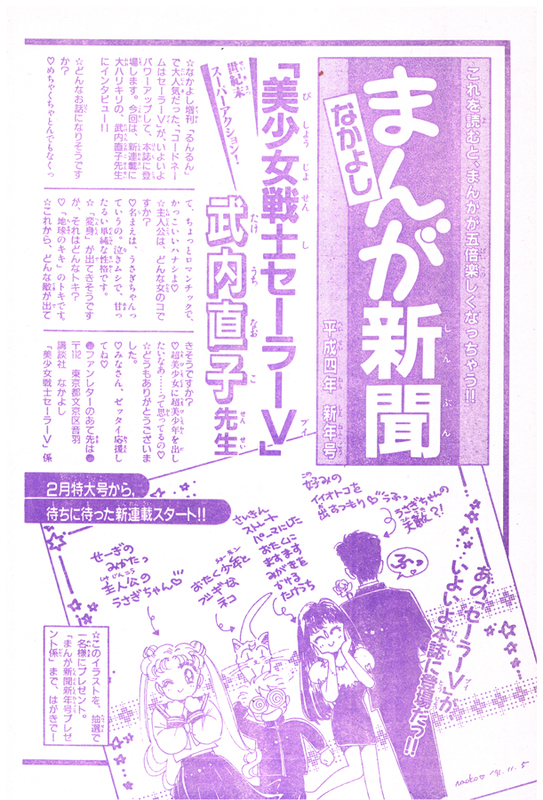 “Code Name: Sailor V,” which has been massively popular in Nakayoshi‘s spin-off magazine RunRun, has powered up and will now be serialized in Nakayoshi magazine!! Thanks for your support! 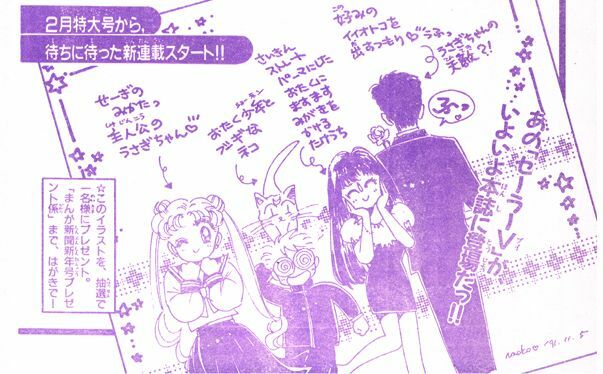 On page 48 of the January 1992 issue, you can see Sailor Moon’s working design, which differs both from her final design and even from the one which appears in the Sailor Moon Materials Collection artbook. In fact, if you look closely, both of the designs seem to differ slightly, so it looks like she had several designs being worked on at once. Sailor Moon here is lacking her tiara and broach, but mysteriously has armor-style shoulder pads and even a crown in one of them. One of the designs appears far more reality-based, at least from the one image, due to the normal earrings and more simply school uniform (and not the normal body-forming Sailor Soldier uniform the team is famous for). Editor (Ed): What will the story be about? Naoko (N): It’ll be a really cool story that’s totally outrageous, with some romance thrown in. Ed: What’s the main character like? N: “Usagi” is her name. She’s a crybaby, but she has a sweet and innocent personality. Ed: It sounds like there’ll be “transforming” involved. When will she transform? Ed: What kind of enemies will she face? N: Incredibly beautiful women and remarkably handsome young men… at least that’s what I’m thinking! And there you have it! 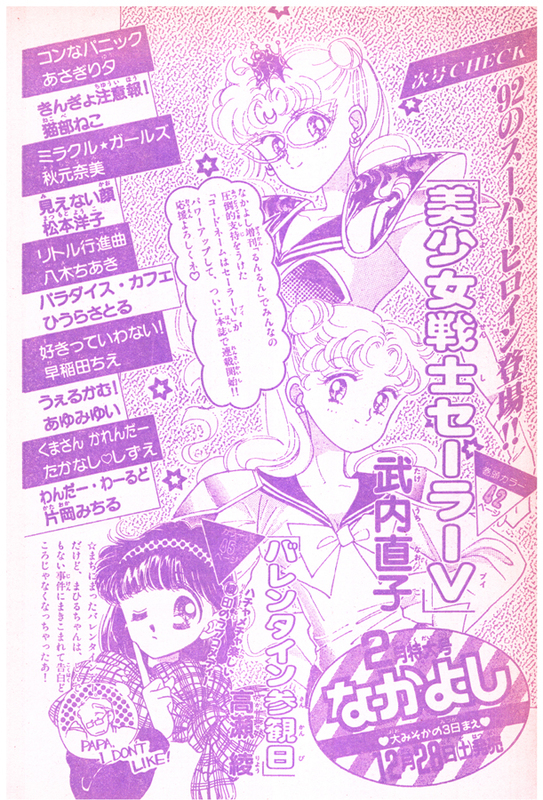 The first time that Usagi’s name was announced to the public… and some more of the background on the series before all the final details had even been decided! 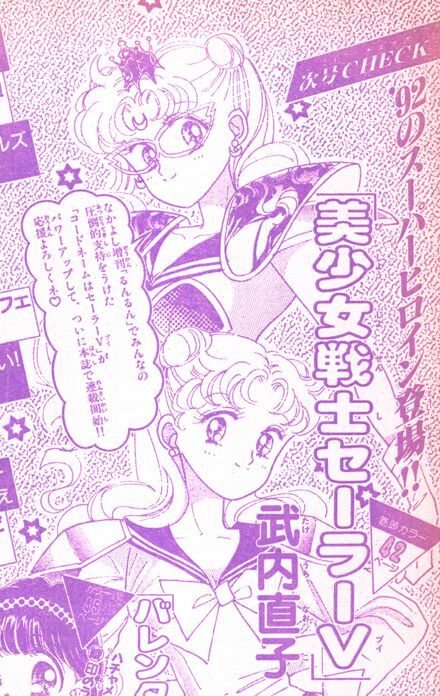 I’d really like to know more about what all this talk of “Sailor V powered up” was meant to imply, and if there were supposed to be any direct connections between Minako and Usagi. Hopefully one of these days more information will surface! Read also: Prism Power Book Kickstarter Now Live! ← Why Was Mamoru Changed to a University Student in the Anime?